Amazing God is a three year evangelization and spiritual renewal plan and initiative that grew out of the vision of Bishop Howard Hubbard and pastoral leaders in the Diocese of Albany. Its goal is to offer each person in our upstate New York diocese an opportunity to know and deepen their relationship with Jesus Christ and to connect with and return to the Catholic Church if they are inactive, unchurched, or have left due to the effects of pastoral planning, scandal, hurt, or indifference. As many other dioceses have done across the country, Albany began a pastoral planning process in 2007 that led to a reconfiguration of parishes and an assessment and redirection of resources due to the realities it faced in fewer clergy, shifting population, aging structures, a decrease in active parish participation , and a growing secular culture. The process named “Called to Be Church” aligned parishes in local planning groups (LPG’s) to focus on the mission of the parish in areas of evangelization, catechesis, prayer and worship, social concerns, and administration. From this opportunity for prayer, catechesis, discussion, and collaboration came recommendations for the present and future of these parishes and the diocese. After receiving these cluster plans and dialogue with pastoral leadership groups, the Bishop announced a new pastoral plan for the Diocese of Albany in 2009. Since that time the number of parishes has been reduced from 163 to 128, all parishes are involved in new models of collaboration and linkage, new models of staffing have emerged, and we are learning to “Be Church” in new ways. Throughout the process, Bishop Hubbard called for a renewed understanding and commitment to evangelization. He took every opportunity offered to him to speak or write about this essential mission of the Church. In so many words he was saying that we had been under construction for the past 3 years, it was time to put aside the hard hats and construction tools, that it was time to live the mission. He evoked great concern and sadness for those who had left the Church because their parish was closed or merged or had been hurt by the church. With the Bishop’s assistance, we built a Task Force for Evangelization that would help to make this a priority throughout the Diocese. 25 people from parish and diocesan leadership met with him in December 2009 to begin this process. After listening to his vision and brainstorming what were essential aspects, we divided into three task groups: diocesan vision and events, best practices, and communication and technology. In March 2010, the Task Force presented Bishop Hubbard with our plan: Amazing God – a three year initiative with the themes God is Love, The Heart of Christ, and Filled with the Spirit. The committees were expanded to include parish evangelization training, reconciliation, diocesan-wide retreat, and art and environment. The first and very significant step as we began to prepare for Amazing God was to communicate the vision and “sell” the plan to diocesan and parish leadership and in turn the people of our diocese. There is a cost in time, energy, and resources in pastoral planning and it was evident, especially among the clergy, that there was pastoral planning fatigue and apathy towards anything new – especially from the Diocese. To communicate the vision, listen to people, and begin to market Amazing God, the Task Force went out to many different regions of the Diocese for listening sessions and focus groups. We heard that many people were ready for the mission, believed it was time for a diocesan wide spiritual renewal initiative, and were very concerned for those in their families, neighborhoods and work – especially younger adults and young families – who either stopped attending Church or who were only culturally Catholic. The three year plan that we presented to the chancery staff included the hiring of a coordinator and program money for three years. We were disappointed to learn that due to the financial limitations of the diocese, the funding for this initiative was limited. We wrote for a three year grant to a local foundation and knew that this was the work of the Spirit when we received enough funding to hire a coordinator and begin this plan. Writing and producing a diocesan wide DVD retreat for the first year theme “God is Love”. Planning and presenting a celebrative “kick off” on June 7 for Amazing God with Bishop Hubbard and Father Frank DeSiano, csp in our newly renovated Cathedral. All diocesan events carried the God is Love theme: the Diocesan Autumn Gathering, the Hesburgh lecture, Spring Enrichment, and events sponsored by diocesan offices. A God is Love DVD retreat with Bishop Hubbard and witnesses was produced and distributed to all parishes, schools, and institutions and placed on the Amazing God website with a facilitators guide. Landings was chosen as the outreach program to the inactive and unchurched. Landings International trained ten parishes and a diocesan team. The annual retreat for parish catechetical and youth ministry leaders featured Lee Nagel on the theme God is Love. Parishes offered catechesis on God is Love from the Old Testament and the sacrament of Baptism. Father Frank DeSiano, CSP, offered an evangelization leaders training at St. Mary’s of the Lake, Lake George in the summer of 2011. Rev. Richard Fragomeni offered an unforgettable keynote on the Heart of Christ at the Autumn Diocesan Gathering. All workshop sessions break open this theme. The James Seeley Award was created in memory of one of the original Amazing God Task Force members and given to the person or parish who best witnessed the goals of evangelization. This first annual award was given to Rev. Bob Longobucco, pastor of two parishes and chair of Amazing God’s “Diocesan Vision and Special Events committee. Landings training was presented in the northern and southern parts of the diocese. The annual retreat for parish catechetical and youth ministry leaders featured Rev. Anthony Ciorra on the theme The Heart of Christ. Parish evangelization team training offered was in January and will be given in May. Rev. John Hurley will give second summer training workshop for parish evangelization leaders. Diocesan Vision and Special events beginning planning for diocesan wide celebration in 2013. In conclusion, We are at the midway point in a three year process and will make a more complete report when Amazing God concludes. Although this was constructed as a three year initiative, Bishop Hubbard wisely reminded us that it really does not conclude in 2013. In many ways this is a prelude to embracing evangelization as the central mission of the Church forever. The learning curve has been great and we have not met some of our original objectives. Evangelization, however, is more of a household word in our diocese. Young people and adults are taking the risk to share their faith more intentionally. Life in our diocese is viewed a bit more through the lens of evangelization and we are happy to be on the road. We are deeply grateful for the mentoring of the Paulist Community and for the incredible resources and training that they continue to offer. 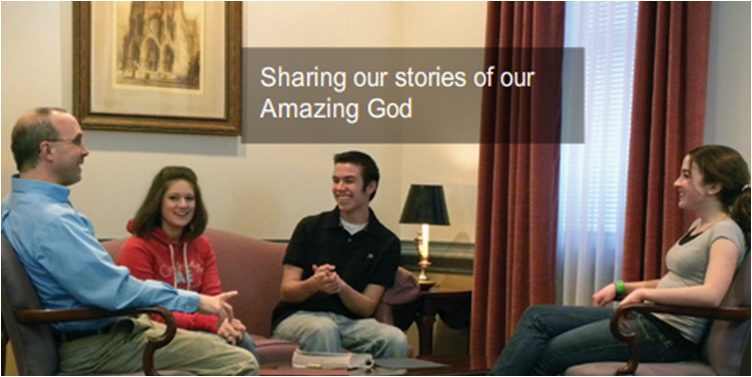 The Amazing God retreat and website may be accessed through our diocesan website www.rcda.org. And share it freely with others. Bring a transformation to out diocese and the world. A renewed enthusiasm for our faith.